The Mix ‘n’ Match bridesmaid dresses trend is catching on, and with good reason. Having all your bridesmaids dressed in the same attire from head to toe is boring, and the uniform does little justice to helping your girls shine in their entirely similar outfits. Today’s brides are intelligent, smart women who want to make sure their best friends and sisters look splendid on their big day. Appreciating their individuality by choosing different dresses for each of them goes a long way in reinforcing this idea. Plus, bridesmaids are your favorite girlfriends, and you want them to be satisfied and comfortable in what they wear. There is however a catch to employing the mix ‘n’ match trend. It is not something that will just fall into place. You, as the bride, have to play a big role in building a cohesive look for your bridesmaids, as only then will your bridal party acquire the intended effect when they all come together. 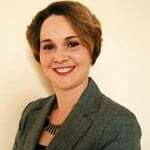 Fortunately, you do not have to seek the services of a personal stylist to get this right. An idea of what combinations work can help you get through, and here are some sure hits. One place where many brides go wrong is in choosing a particular color and giving bridesmaids free reign to pick a dress that they like as long as it falls into this color spectrum. Well, it may work for certain colors like black, gray or gold, but not any other. Unless your bridesmaids go shopping together and you or someone else oversees what they choose, you will not know if the shades they pick will work together. This is a recipe for disaster. Let me make things a little clearer. There are a thousand different shades of green, some with hints of blue in them, others with hints of yellow. If your six bridesmaids each picked out their own version of green, it is likely that at least one of them will look drastically different from the rest. Instead, give your girls free reign over the style of dress they choose, as long as they stick with dresses from a single designer collection. This is because most designers offer the same colors, in different styles. For example, these different pink dresses from the Dessy Collection would work like a charm, don’t you think? In a welcome deviation to the single solid color for bridesmaids dresses, you can render a personal touch to each outfit with interesting prints and patterns. Not only does this add oodles of style, it is fashionable and your girls will get better use out of these dresses than just at your wedding. One unique idea I found on the Every last detail blog is to limit your bridesmaids to a single shade, but pick a patterned dress for your maid of honor. How interesting is that? Check out their blog page at the link above for more details and pictures related to this idea. You could also mix patterned dresses and dresses in the same solid base color for a different effect. 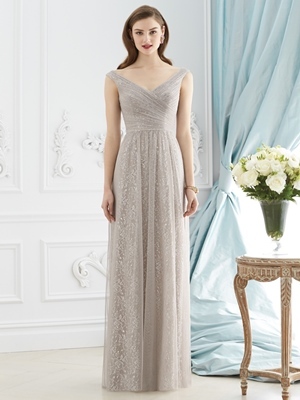 Above is a stunning dress from the Dessy Bridesmaids collection with a speckled pattern. Imagine how beautiful it would look when mixed with a dress in solid grey or navy to get a beautiful effect. For example, the dress featured below could be a befitting combination for this rococo speckled gray dress. The soft texture and speckles of prints on the rococo lace dress complement the beautiful gray chiffon dress with the ruched bodice. Although both dresses possess individual style, you can still create a cohesive look with both of them. Yet another great way to mix and match bridesmaids dresses, but in a safe way is to mix textures in exactly the same color. Take a look at this image of buoyant beautiful bridesmaids in lavender. Notice how each of the dresses are entirely different from the other, but the breezy fabrics used in different ways in each of these dresses render a cohesive look to all the women. The main attractive factor about this style of mixing and matching dresses, is that you can find dresses that suit the personalities of all your bridesmaids. This allows you to not just find stylish dresses for each of them, you can also make sure that all their looks come together. When opting for this method, remember that you will have to invest more time and effort, as slight differences in color or entirely different fabrics can change the overall look. To make sure you nail it, you will have to see all the dresses together, and have a dress rehearsal to make sure that they go together as intended. Give each of your bridesmaids her unique look by choosing soft pastels or dusty barely there colors that do not compete with each other. Although we initially discussed that different hues in a single color are not a great idea, pastels are an exception to this rule, as all the colors are muted, and create a beautiful palette with a subtle hint of refreshing color. A pastel palette is perfect for your bridesmaids dresses, if you are a bride who wants color at her wedding, but not ones with overpowering intensity. Pastels are pleasant, but soft, and so they are bound to mix together well. Imagine your beautiful bridesmaids in a rainbow of pastels similar to what you see in the image here. Need I say more about how stunning the effect will be? Dusty colors look sophisticated, and they add grace and elegance to the stride of your bridesmaids. Since most dusty colors are almost neutral in appearance, you needn’t worry about whether they will blend together. This is in fact one of the easiest ways to coordinate your bridesmaids outfits. Experiment with different necklines, patterns and styles by keeping the fabric uniform, and you simply cannot go wrong. The color and length are unifying factors, and you needn’t worry about whether the bridal party look will come together. Let’s face it, not all your bridesmaids may feel comfortable showing off their shoulders and decolletage in a dress with a sweetheart neckline. A few of them, on the other hand, may appreciate the chance to showcase their slender neck and toned arms in a strapless gown. By varying the neckline and sleeves, you make sure each girl has a dress with a unique style quotient, and this makes it easier for them to find a dress that suits them. You will also have to put in lesser effort to find your bridesmaids dresses. All you have to do is choose a color that works, and then explore the various options in sleeves and necklines and find those that will work for each of the bridesmaids. It is easy to find bridesmaids dresses in different patterns but the exact color, when you choose from a single collection. Here’s a wedding picture, where they’ve got it right. Don’t you see how it is cohesive, yet individual? Now that you have enough pictures to draw inspiration from, you are all set to go shopping for your bridesmaids dresses. Before you go start, we thought of running you through the common mistakes you should try to avoid. We cannot stress enough on the impact that is created by varying textures. The same color can look entirely different when it is applied using two different types of fabric. So, pay close attention to texture when you choose the dresses. This is especially important if your bridesmaids go shopping individually, as you may end up with entirely random looks when they come together, if the textures are distinct. The best way around this is for you to specify the fabric. I’ve said it a hundred times before, and will reiterate that everything boils down to cohesion. Not only should the bridesmaids dresses go together, but they should also coordinate well with the venue and the ambiance. Before you finalize your bridesmaids dresses, make sure that they are suitable for the style of wedding you have planned. Dresses that are appropriate for a formal indoor wedding can be totally inappropriate for an outdoor beach wedding. 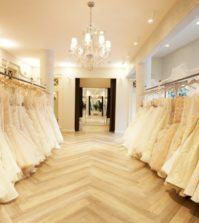 The fix is to first determine the venue and understand the mood of the event; then choose bridesmaids dresses that will complement the theme and style of the wedding. Many brides believe that their bridesmaids should be dressed in the central color theme, even if it doesn’t complement their skin tone. Do you agree? If you do, it is likely that your bridesmaids will not be smiling with satisfaction at your wedding. After all, they too want to look great on your big day. Wearing a color that isn’t flattering but does the opposite will ruin their chances of looking good in your wedding pictures. Fortunately, there is an easy fix to ensure everyone is happy. All you have to do is dress your bridesmaids in a neutral color that complements your wedding palette. 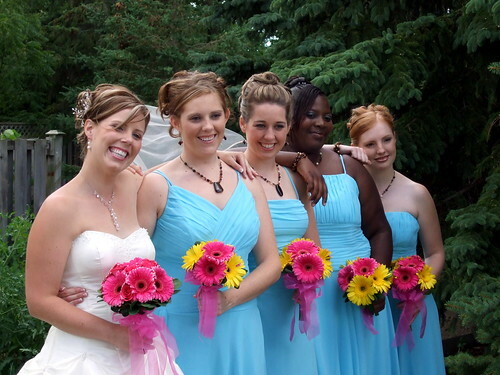 Check out this article on universal bridesmaids dress colors for some valuable tips. Bring in the central color used in your wedding theme through your accessories. There are many smart ways to incorporate this. You can opt for colorful bouquets, attractive accessories like shoes or belts, or a beautiful necklace. Now, do you think your bridesmaids will be a lot happier with the colors you’ve chosen for your wedding. While mixing and matching is fun, you should limit the extent to which you use it. Stick with just one or two factors. If you vary several features all at once, it will not only look disjointed, but the entire intent of using it is defeated. The last thing you want is to put in all that effort in planning your bridal party look to the last detail, and leave your guests to believe that you just went with what was available. Remember that it is difficult to satisfy everyone of your bridesmaids. So, draw the plug on what has to be uniform. Keep the fabric and color uniform, and allow them to choose their favorite neckline or sleeve length. Or keep the neckline and hemline uniform, and vary the pattern and color. By doing this, you can ensure that the overall look isn’t chaotic. This covers all you need to know, so your bridesmaids are happy in different dresses that tie to the central theme, yet different in their own respect. Will you be going with this trend for your wedding? If so, what will your choices be based on? Do let us know through your comments. Finding bridesmaids dresses of any type, size, pattern or color is now easy with our collection at Best for Bride. Make your choice from leading designer collections including the Dessy Bridesmaids collection, Mori Lee, Angeline Faccenda, After Six and more. Whether you would like to stick with a single designer collection, or check out your options from different designer collections, we have all the options you want in-store, along with some fabulous offers to help you save money. Visit our online bridesmaids dress gallery to browse through all our collections and choose the ones that you like best. Remember that every pattern you see online is available in a range of colors, so customization has never been more easy. With every dress featured here available in all sizes, you needn’t look anywhere else to find all you need for your entire bridal party. You know what? I like the mix and match idea. That is not something that I thought about when getting my ideas together for dresses. Thanks! Going for the same color is what I have in mind. I do like the idea of switching up the styles, but keeping the colors the same. Mixing things up is a good idea. That way it does not appear that everyone is wearing the same exact dress. The pink ones work well! I also like the dresses that are the same style and pastel in color.